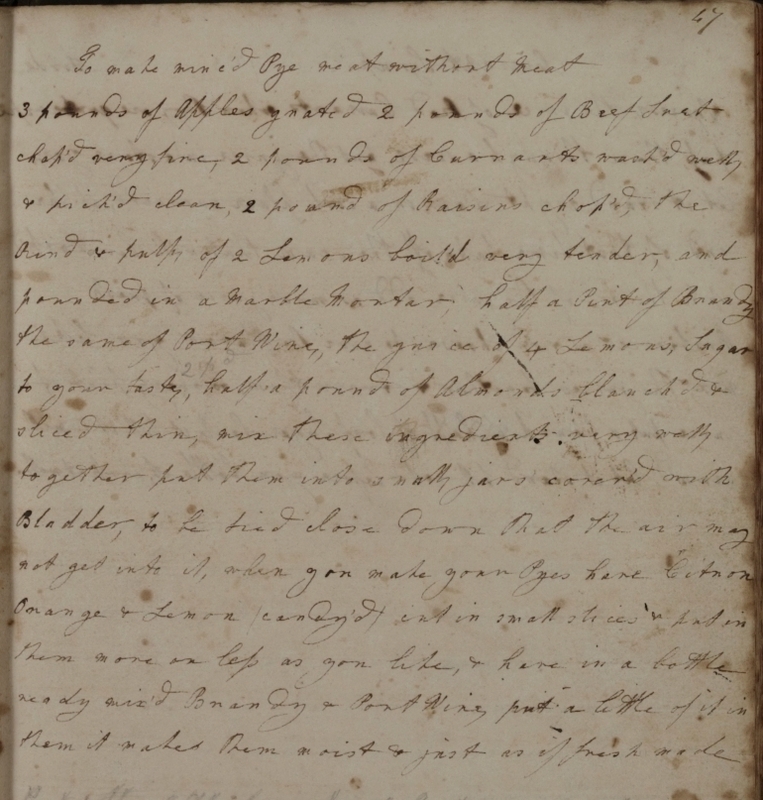 A little while ago we brought you some recipes from the kitchen of Mary Rooke of Langham Hall, and today we see the sort of things that she got up to at Christmas. 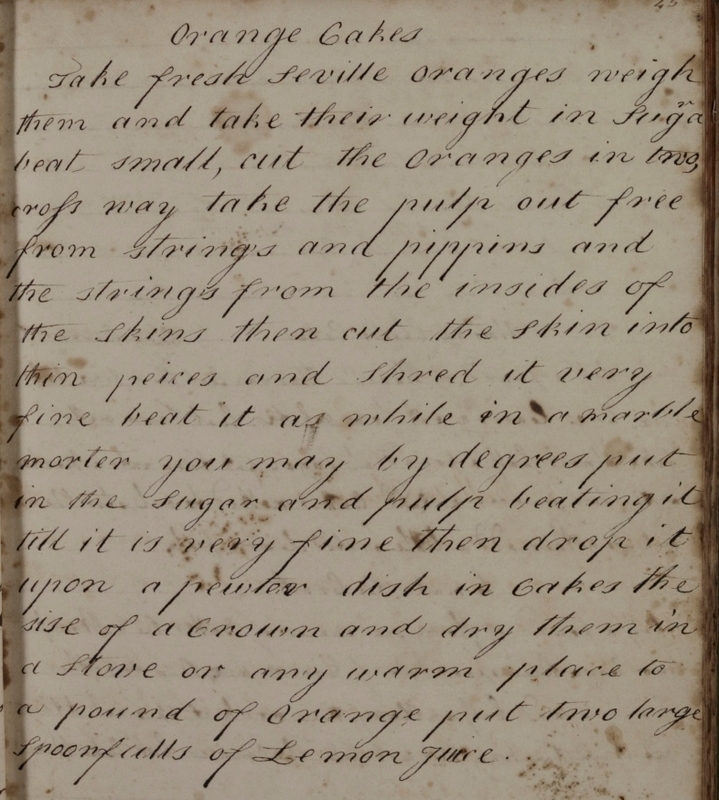 You can view images of Mary’s entire recipe book on Seax here (D/DU 818/1). 3 pounds of apples grated 2 pounds of Beef Suet chop’d very fine 2 pounds of Currants wash’d well & pick’d clean, 2 pound of raisins chop’d, the Rind & pulp of 2 Lemons boil’d very tender, and pounded in a marble mortar, half a Pint of Brandy the same of Port Wine, the juice of 4 Lemons, Sugar to your taste, half a pound of almonds blanch’d & sliced thin, mix these ingredients very well together put them into small jars covered with Bladder to be tied close down that the air may not get into it, when open make your Pyes have Citron Orange & Lemon / candy’d / cut in small slices put in them more on top as you like, & have in a bottle ready mix’d Brandy and Port Wine put a little of it in them it makes them moist & just as of fresh made. Take fresh seville oranges weigh them and take their weight in sugar beat small, cut the oranges in two, cross way take the pulp out free from strings and pippins and the strings from the insides of the skins then cut the skins into thin pieces and shred it very fine beat it as while in a marble morter you may by degrees put in the sugar and pulp beating it till it is very fine then drop it upon a pewter dish in cakes the size of a Crown and dry them in a stove or any warm place to a pound of orange put two very large spoonfulls of Lemon juice. This entry was posted in Archives, Recipes and tagged cake, Langham, recipes by admin. Bookmark the permalink.